Save Popplets as Images: Two Minute Tutorial | Poppletrocks! Today we have a two-minute tutorial to help you save Popplets as images. You can save your Popplet creations as JPEGs and PDFs! 4. You will be given a choice to save your popplet as a jpeg or pdf file Select “Export as JPEG”. 5. You will be able to save your popplet with a name that describes your work. 6. Voila! Your Popplet is saved. You can now email your Popplet, post it on Facebook, or add it as an image to your website. Don’t forget you can directly embed your popplets in your website with our HTML embed code if you want to create an interactive experience on your blog. We are working on creating a higher resolution for Poppleteers who need to save a complex Popplet with lots of detail. In the meantime, if you need a higher resolution image, you can take a screenshot of your Popplet and save the image from your screenshot. This may be in higher definition than our jpeg, depending on the amount of information in your Popplet, and will allow your viewers to zoom in to the (readable) detail on your biggest popplet creations. You can also save your JPEG to a Pinterest board.If you want to direct viewers to the original Popplet, make your Popplet public. Upload the JPEG as a pin to your Pinterest board. After you have pinned the Popplet, click on the Edit button. Add the Popplet URL link to the link field. Now, when viewers click on your Pinterest image, they will be directed to the original interactive version in Popplet. Test it out! 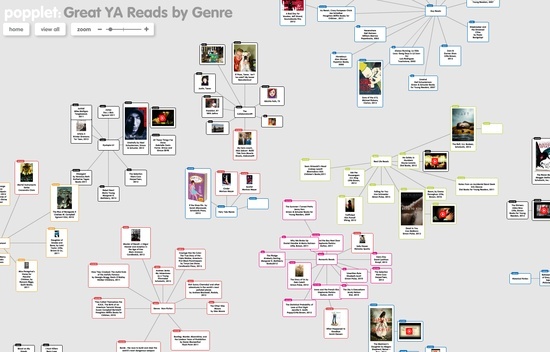 Have a look at our example, with @yabooksandmore’s Popplet on young adult fiction on Pinterest. Click below to go the version on Pinterest, and then click again on the image to get redirected to the publically viewable version on Popplet! Have you saved a Popplet as an image? Post your image to our Facebook wall and let us know how you have used it! This entry was posted in Help, Popplet, Popplet Techniques, Tutorial and tagged Pinterest images, popplet tutorials, saving popplets as images, tutorial by mark. Bookmark the permalink.